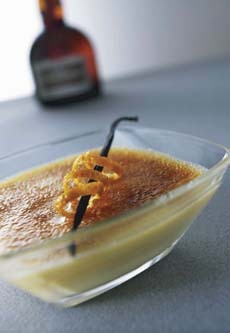 Make a classic crème brûlée even more special with a touch of orange liqueur. Photo courtesy Moet Hennessy USA. We love crème brûlée and with its crunchy sugar top; we love Grand Marnier with its deep orange richness. Here's a recipe that combines both, and a suggestion that the crème brûlée be served witha glass of Grand Marnier liqueur. 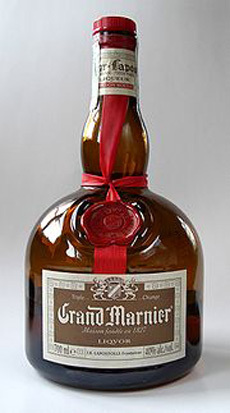 Grand Marnier was invented in 1880 by Louis-Alexandre Marnier Lapostolle. The recipe was inspired by one of his favorite rituals: adding an extra drop of cognac to his orange liqueur. The result is the flavor is of candied orange and macerated citrus fruit softened by notes of pine, sandalwood and Earl Grey tea. There’s a heavenly aroma on one end and a long and happily persistent finish on the other. Crème Brûlée is an equally magnificent baked custard, differentiated with a topping of burnt sugar, creating a crackling, crunchy top. Here are the different types of custard and the different types of orange llqueur. GRATE the orange zest finely and let it macerate in the Grand Marnier liqueur for an hour. BRING the milk and cream to a boil. Add the vanilla bean, the macerated orange zest and the sugar and let infuse for an hour. Strain to remove the vanilla bean and the orange zest. ADD the egg yolks, mixing gently so that the mixture does not froth. Pour into ramekins and cook in the oven at 230°F in a bain-marie for approximately 50 minutes. (If using a convection or forced convection oven, cook at 175°F without the bain-marie (more difficult) for approximately 30 minutes.) The crème brûlée is coked when it is set in the middle and “trembles” when the ramekin is tapped. REMOVE the ramekins from the oven and allow to cool, then place them in the refrigerator. Just before serving, sprinkle with a thin layer of brown sugar and caramelize with a blow torch or under the broiler (more difficult). OPTIONAL: Serve with a liqueur glass of Grand Marnier. If the custard cooks too quickly it will be slightly granular, not creamy as it should be. If a little moisture has formed on the surface of the crème brûlée when it is taken out of the refrigerator, soak it up with paper towels before sprinkling with brown sugar. Recipe and photo © copyright Moet Hennessy USA. All other material Lifestyle Direct, Inc. All rights reserved.